Give the gift of peace of mind and body with this deck of over 50 prompts and exercises. In yoga class you're a star: breathing fully, staying present, connecting body and mind. Keep that same focus after your downward dogs with these meditative cards. 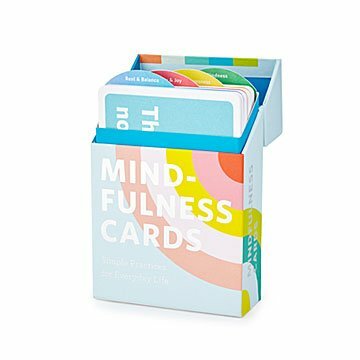 Inside the colorful box are over 50 prompts and exercises divided into four sections: rest and balance, curiosity and joy, insight and awareness, and kindness. The cards help you learn to appreciate little things like the ground beneath your feet and tree above your head. But they also introduce you to deeper, long-term practices like cultivating a sense of self-care and acceptance. A lovely, useful gift, the deck's teachings will stick with a loved one for their lifetime. Made in China. This was a gift and I didn't actually see the cards in person yet, but the person that I bought it for was extremely grateful and said the cards would definitely be read and reread.